The snapshot above was taken about 1955 by my brother, David, who was standing on a chair. 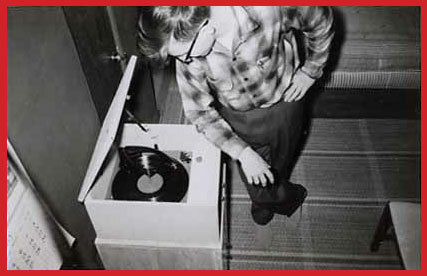 The record player was a Magnavox, the best available to me at the time, as I was not an engineer able to build my own, nor rich enough to buy custom-made gear. That's a Columbia LP playing... It might be CL 500, the very first Columbia 12" pop LP, a Benny Goodman compilation. rich journey. Please enjoy browsing in my work!